GoPro Fusion is GoPro’s first all-in-one 360 camera. It was originally announced it April and generated a lot of interest not only because it was from GoPro, but also because it had a 5.2K video resolution and the 360 video teaser showed impressive stitching. GoPro also coined the term “overcapture” for presenting a cropped portion of a 360 video as a conventional 16:9 Full HD video. 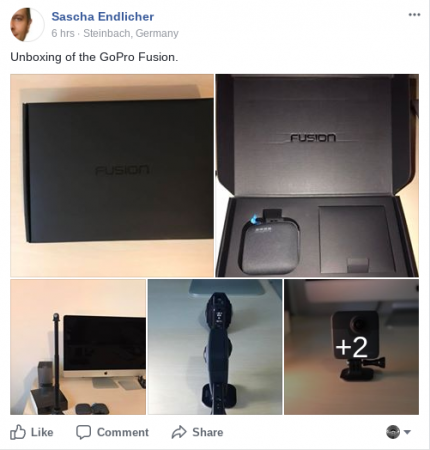 GoPro Fusion was formally launched on September 28, when GoPro announced its price of $699 and moved its availability from 2018 to November 30, 2017. The launch was moved up to November 24, and orders have begun shipping to some buyers. 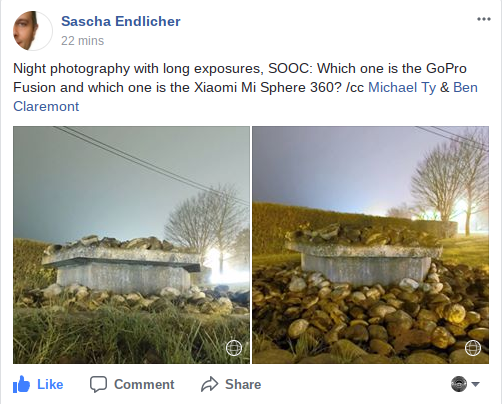 He also posted long exposure 360 photos with the Xiaomi Mijia Mi Sphere and the GoPro Fusion. Check out the unboxing photos here and the comparison here. Sascha has generously made the original files available here. Thanks again to Sascha for sharing these photos. If you’re interested in the Fusion, you should also join the Facebook group for GoPro Fusion 360 Camera Users and Fans. The Fusion is available for purchase direct from GoPro. I think the same. The left picture is more natural. In GoPro Colors on the right You have to use a filter betteri think. It looks like they do to much. Most go pro Fusion pictures if they was not done in Adobe optimised look more pixulated. I think its wize to go with Mi. For Beginners also. For me its enough directely to Do all the work on the App. Also with the Mi. Hard calculation is i have to buy GoPro, I have to Buy new Mobile, I have to buy new Laptop, I have to Bye Adobe Premiere and Adobe Photoshop… All in all its 5000+$ to have a start for a view pictures i Holydays. With the Mi i invest in the Mi for now seen 180 and a Mobile for 200. Thats reasonable for a start.